If I wear a hat doing work out in the yard, I usually wear a baseball cap style hat, as is common around here. But the other day a few of my hats fell apart in the laundry, they were getting so worn. So while I was at Farm & Home getting feed, I thought I’d look at hats. 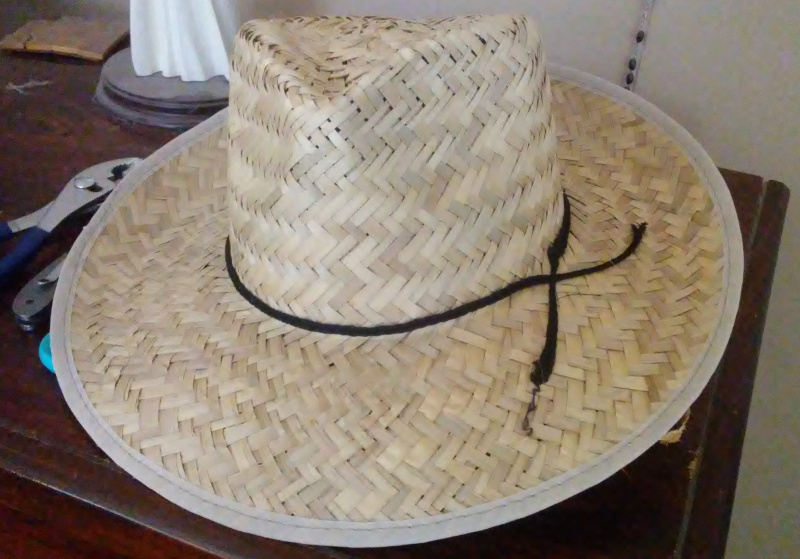 I gave up on those and walked over to the display of real hats – fedoras and straw hats and such, not baseball caps. Some of those can run up to $100, and they may be worth that, but I just wanted something to keep the sun off my face. Then I saw this one: $5 plus 30% off. Now we’re talking. I may look like an Amish with the wrong kind of beard, but it’ll keep the sun off better than a cap would, and may be cooler.